The production of value-added products from renewable raw materials is Borregaard's strategy. GEA is supporting its customer with the supply of a turnkey plant for the spray drying of lignosulfonate in the double-digit million range. 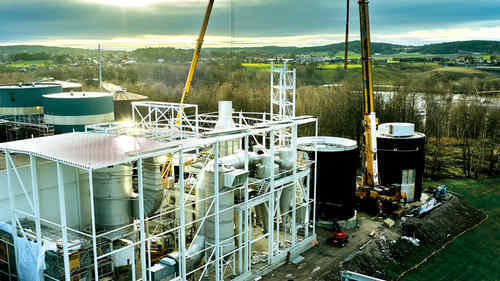 The solution also includes a new silo for feeding stored powder materials into the plant's packaging system and a large wet scrubber for dedusting. The entire process solution will be installed at the Norwegian site in Sarpsborg and commissioning is scheduled for the middle of 2019. "We have emphatically underlined our competence not only to supply a spray dryer, but to offer our customer a complete solution for lignin production", says Mette Aagaard Rasmussen, GEA Area Sales Manager, APC Chemical, Business Area Solutions. "Borregaard has already implemented various projects with GEA Norway in the past and already uses GEA decanters and separators. It was the successful combination of our strong customer relationship, the smooth cooperation across various GEA functional areas and our knowledge and experience in the chemical business that ultimately convinced Borregaard," says Mette Aagaard Rasmussen. According to Ståle Schie-Veslum, Senior Purchaser at Borregaard, the new investment will allow further specialization of lignin production and thus greater flexibility and added value in the chemical market. "Our plant in Sarpsborg has an annual capacity of 160,000 tons of lignin, an increasing proportion of which are special products. We will optimize our production with the new GEA equipment," he explains. "The new infrastructure and energy facilities will reduce energy costs and offer significant environmental and safety benefits," says Ståle Schie-Veslum. As a water-soluble polymer, lignin is an organic substance found in trees and plants. It has a number of important functions as a support material, such as the strength of plant tissue, especially for its compressive strength. Therefore, the largest area of application for lignosulfonates is as a wetting and dispersing agent with about 68 percent. Due to their good adhesive properties, lignosulfonates are used as organic binders for a wide variety of applications, for example in concrete and building materials, textile dyes and ceramic products. At this plant the 25 t/h of lignosulfonates is directly fed into a rotary atomizer and spray dried. The final product is separated in two groups of consecutively cyclones. The second newly developed cyclones CEE (Cyclone Extra Efficiency) offers a higher separation efficiency, which increases the yield and reduces emission. In real life tests, the CEE powder separation efficiency was verified as being considerably higher than the efficiency of standard cyclones. Part of the spray drying plant is the large wet scrubber for dedusting. The Venturi scrubber uses water to clean the exhaust gases from the spray dryer before they are released into the environment. The scrubbing water is circulated and fed continuously to a falling film evaporator for concentration and recovery of valuable substances. The condensate is returned to the spray dryer as process water and thus increases the total product yield while the concentrate is discharged. The evaporator is designed for 2 h/t of scrubbing water and energetically optimized by heating through mechanical vapor recompression.